First Edition Leaves Dies, 12x12 Textured Card Stock. 1. Cut out four bunny ear shapes, (for the front and back) using Dovecraft white felt. Cut out two smaller bunny ear shapes, on to pink felt to create the ear centres. 2. Take two wires and bend to make the ear shape, add tape to the ends of the wire to cover them. 3. Flip one of your ears over and place the wire in the middle. Layer on top another white ear shape with glue. Repeat this with another bunny ear. This will enable them to be shaped. 4. Place the ear in front of the headband and bend around the headband. Stitch the ear into place to secure. Repeat with the second ear. 5. Adhere the Dovecraft pink felt to the ears with glue. 6. Die cut a few of the First Edition Foliage leaves dies onto two different shades of green card from your First Edition Textured Card Stock 12x12 Paper Pad. Cut down the leaves. 7. Glue the Dovecraft Couture du Jour Paper Flowers along the edge of the headband to secure, allow to dry. Add the die cut leaves by slotting them into the blooms, secure with glue. 8. Add Dovecraft Clear Glitter along the edge of the pink felt, flowers and leaves to finish. 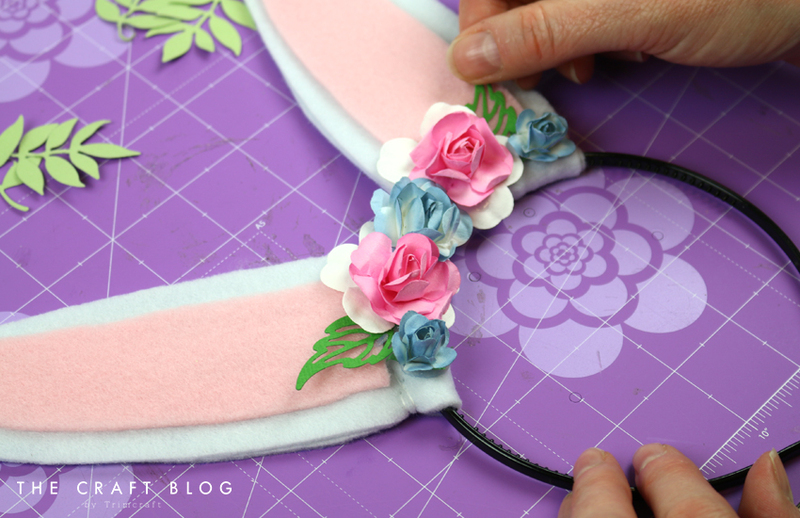 This Easter headband will be so fun to wear and you could make more to wear with friends and family! 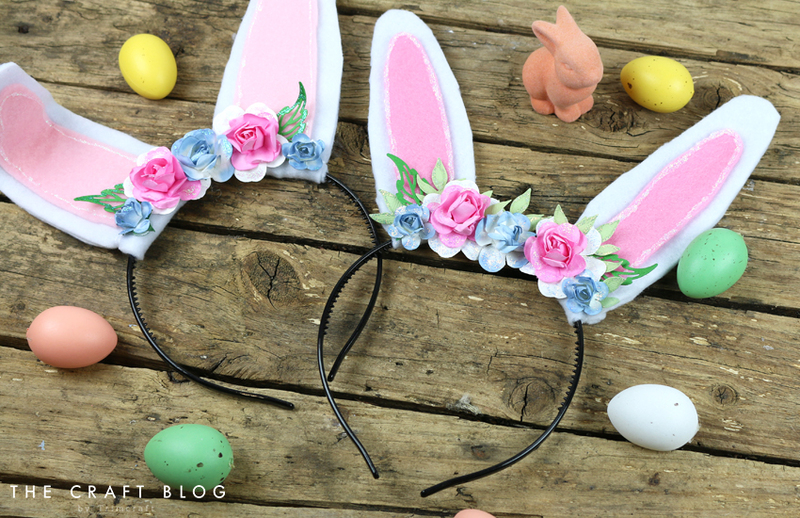 How will you decorate your bunny ears? We would love to see so don’t forget to #trimcraft when sharing on social media and to upload your makes to the inspiration area. These are so cute. IWe made some very much alike these with the grandkids a few years ago, and I´m sure, that at least some of them still have them and play with them from time to time. And they´re sooo easy for the kids to make them self, with just a little help from an adult, and they´re soooo sweet and cute.